54 SMT Magazine • March 2015 minutes more. Unfortunately, there is no rule of thumb, so keep in mind that every component and assembly must be assessed individually. High reliability and efficient large-area en- capsulation are correlated. False. 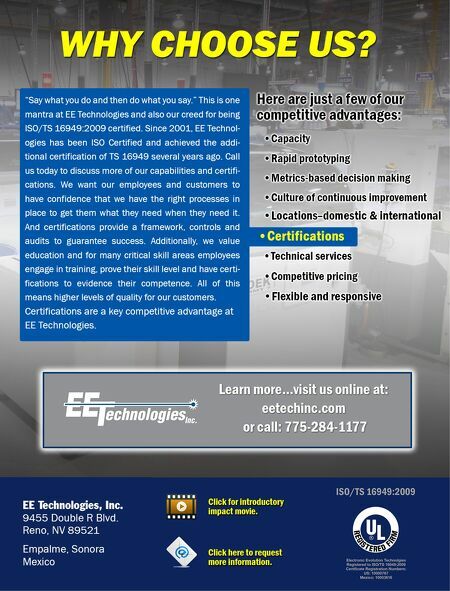 Due to the dissimilar coefficients of expansion (CTE) of chip (Si, 4 ppm/K), bond wire (Au, 14/Al, 23 ppm/K), bond pad (Cu, 16 ppm/K), printed circuit board (FR4 10–20 ppm/K/ ceramics 1–3 ppm/K) and encapsu- lant (epoxy, mostly more than 20, up to 250 ppm/K), thermo-mechanical tensions arise and may cause wire fracture, bending of the sub- strate (warping) or debonding of the encapsu- lant from surfaces wetted during encapsulation. Large-area encapsulation exacerbates this prob- lem, making the separation/singulation of the packages by sawing more difficult. However, encapsulants with a CTE of 11 ppm/K have recently been developed. With their low coefficient of expansion, they prevent these tensions, which significantly shortens the process time. If high reliability is required, one-compo- nent materials are the material of choice. True. One-component materials are the standard encapsulant used in electronic pro- duction. They are easy to use and offer better features for high-requirement applications. This type of material tends to be less suitable for larger area applications, like those found in mechanical engineering electronics, where large volumes cannot be transported in frozen condition. Should this situation arise, two-com- ponent products are used. Two-component products are nearly as re- liable as one-component products. The major difference is that a user cannot mix two-adhe- sive components as thoroughly or as long as an adhesive manufacturer can on a large produc- tion scale. Dam and fill is superior to glob top encap- sulation. True. Dam and fill is a more powerful meth- od than glob top encapsulation as more defined shapes can be implemented. A dam is dispensed with a high-viscous adhesive. The space is then filled. Therefore, dam and fill is mainly used for large assemblies or in confined spaces. If flow- ing is not critical to a certain extent due to the design or other factors, a glob top can be used. This saves one process step. Therefore, only dam and fill materials come into question for partial encapsulation. False. In practice, partial encapsulation is often required by sensor applications where the sensor detects information under harsh envi- ronmental conditions, while the chip must re- main protected. In such cases, not all parts of the chip are covered by adhesive. It is particu- larly important that the adhesive cures in the specified position without flowing. 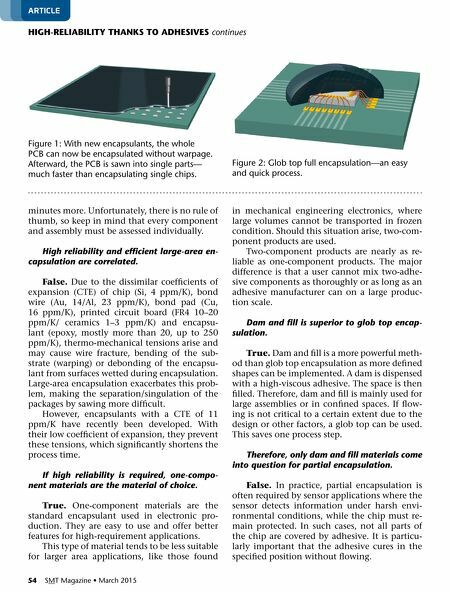 artICle hIGh-rELIaBILITY ThankS TO aDhESIvES continues figure 1: With new encapsulants, the whole PCB can now be encapsulated without warpage. Afterward, the PCB is sawn into single parts— much faster than encapsulating single chips. figure 2: Glob top full encapsulation—an easy and quick process.